My first memories of chemicals to control pests and diseases was at Acle Secondary Modern School during Rural Science (Gardening) lessons in the early 1970's when teacher Alan Bidwell mixed up a white looking solution of Malathion (Formula: C10H19O6PS2) to spray greenfly in the school greenhouses, all the pupils thought what a horrible smell as it was mixed up in a container at the back of the classroom, later in life I was to learn more about pesticides, their formulations, how they performed to control pests, diseases and weeds, storage and handling, how to use in a legal and safe manner and their impact on the environment and native wildlife. 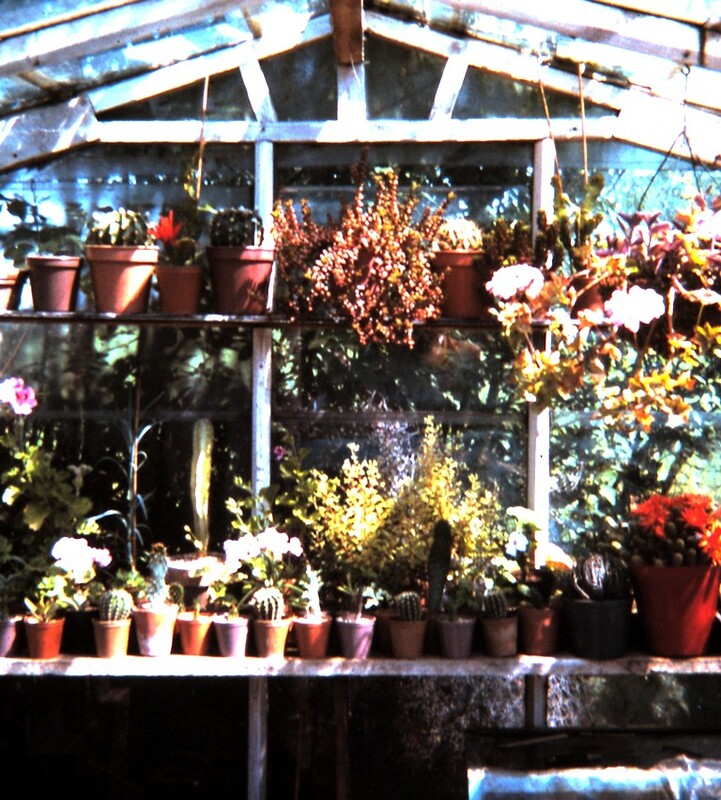 During my early teens looking after the school greenhouses and my own (well Dads) greenhouse at home I saw lots of pests and diseases on the plants I grew and self taught myself how to control through visiting local garden centres reading information on bottles of chemicals on the shelves as well as reading my favourite gardening value for money books "The Expert Series" by Dr. Hessayon many of which I purchased second hand, I loved reading the well illustrated, colourful and easy to understand books as a teenager, I still have many in my library. 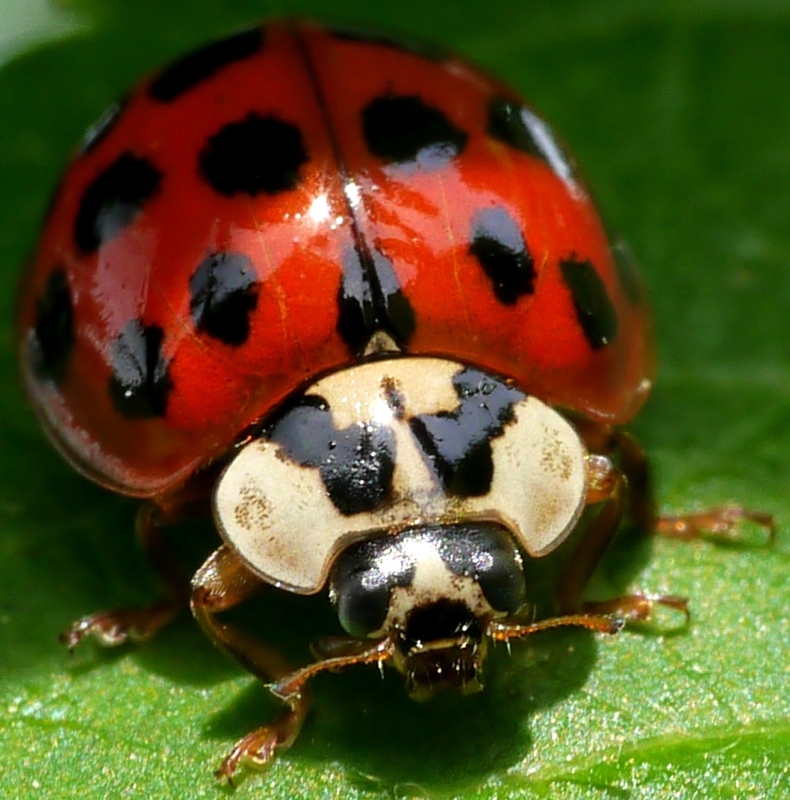 The first pests I identified in my greenhouses were aphids (greenfly, blackfly and whitefly), red spider mite and mealy bug (they hid in my many cacti) outside on the vegetables and cut flowers there were cabbage white caterpillars, wireworm, eelworm, slugs, earwigs and leaf miner. During the mid 1970's at the Norfolk College of Horticulture, Burlingham, The Berkshire College of Horticulture, Burchetts Green and The Royal Gardens Windsor I learned about and was taught to identify lots of pests, diseases and weeds in the classroom and on site, I sent away for free Ministry of Agriculture, Fisheries and Food advisory leaflets about various pests, diseases and weeds to read and use as additional information for my horticultural training and read any books I could find. 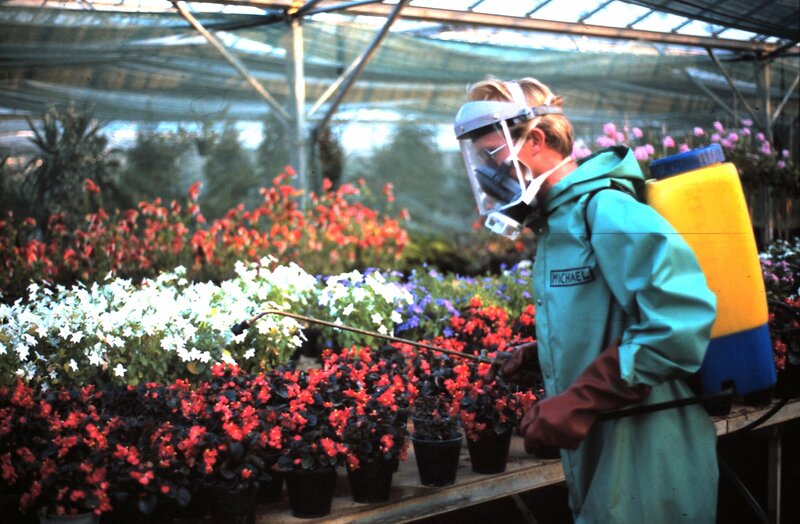 Professional use of pesticides and fertilisers came for me when I began working at Earlham Nursery in 1977, after planting out Autumn bedding on the top nursery I was asked to apply dry Sulphur Dust to Myosotis (Forget Me Knot) through a hand cranked puffing application machine to control Powdery Mildews I was also given a dust mask to wear over my mouth and nose, the Sulphur was best applied on a still early morning with light moisture on the leaves, I would walk up and down the rows aiming the long applicator tube at each plant winding the handle to puff dust to stick to the moist leaves. 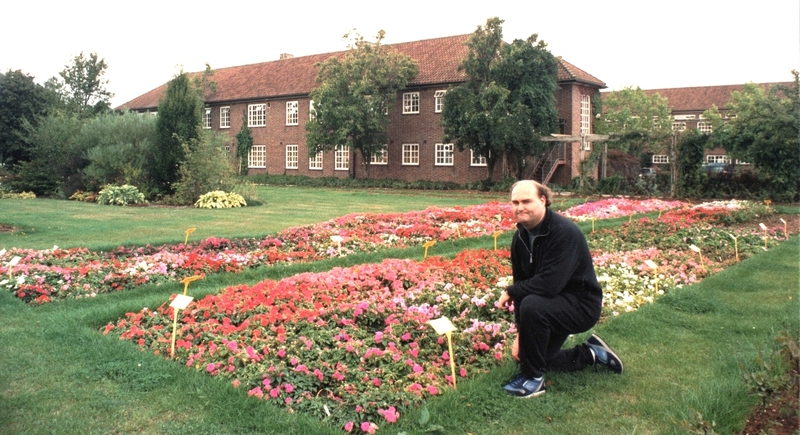 During the 13 years I worked at Earlham Nursery I used many pesticides and fertilisers and saw many changes to products, safe storage and handling, personal protective wear and equipment and legislation, I learned more about and encouraged the use of Integrated Pest Management, the use of good hygiene, cultural practices, observation and communication to prevent pest and diseases, use of pesticides when only necessary and rotation of products to reduce resistance with use of biological control through insect predators and eco friendly products such as yellow sticky traps and soapy solutions. 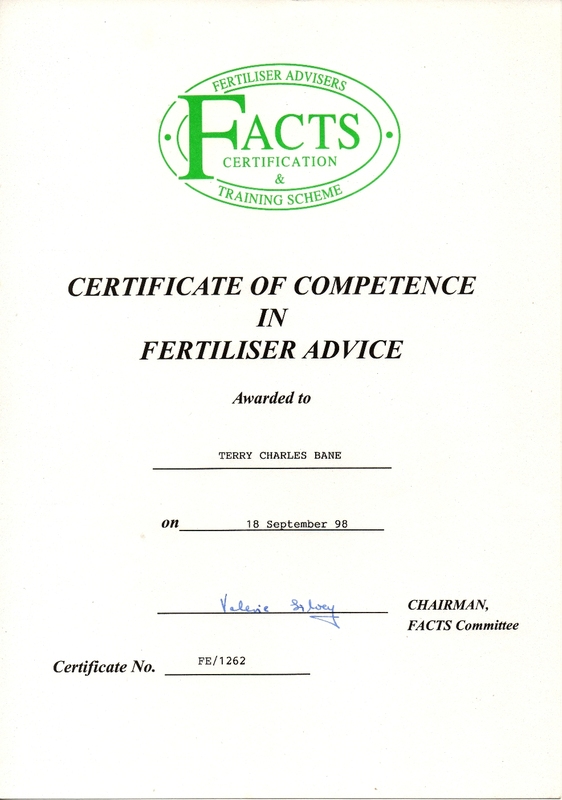 The Food and Environment Protection Act 1985 and Control of Pesticides Regulations 1986 meant everyone applying pesticides had to receive training and pass a National Proficiency Test Council Certificate of Competency and then individual modules, Hand Held Applicator using a Knapsack Sprayer and specialist module Mists, Fogs and Smokes, myself and colleagues at Earlham Nursery attended training at the Norfolk College of Horticulture, Burlingham as well as a practical exam in the greenhouses at Earlham during 1988. 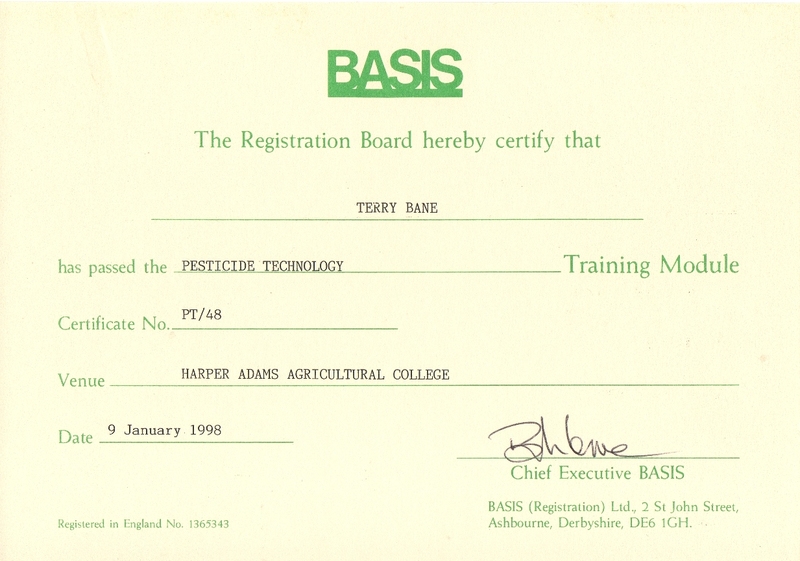 A certificated pesticide store keeper was also required, I took my first B.A.S.I.S. 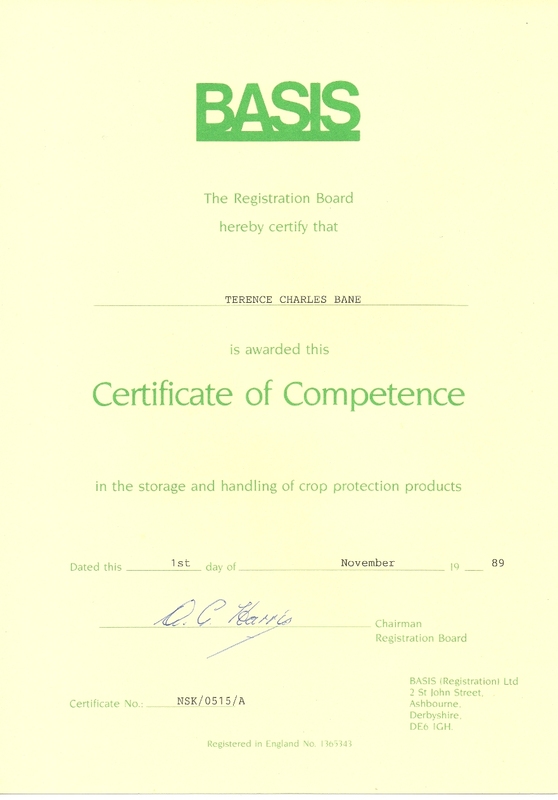 exam in 1989 as I managed purchasing, stock keeping and records of all pesticides used in and around Earlham Park nursery. When I left Earlham Park and Nursery in April 1990 and joined the Grounds Maintenance Contract Unit I did not use pesticides anymore or was involved with their use until 1994 when I became Norwich City Councils Horticultural Officer, because of my experience and use of pesticides I was asked if I would be willing to attend 3 weeks of specialist training over a 9 month period and take an exam at Writtle University College, Chelmsford. 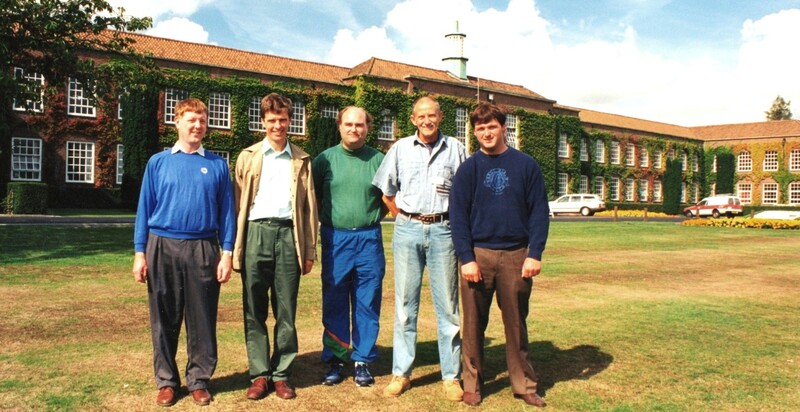 I enjoyed the training and staying at Writtle College, met and made some good friends including Brian Harker, a private contractor from Stamford, Brian and myself both passed the B.A.S.I.S. 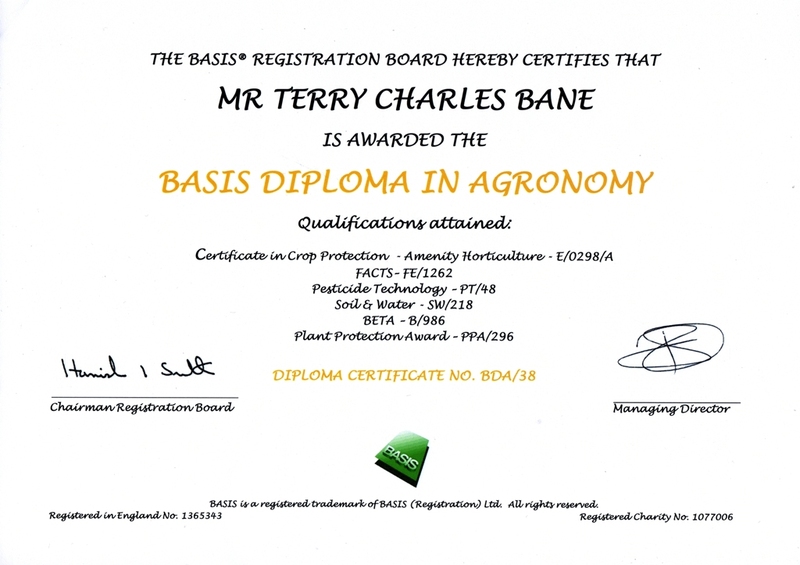 Certificate in Crop Protection and were advised to join the B.A.S.I.S. 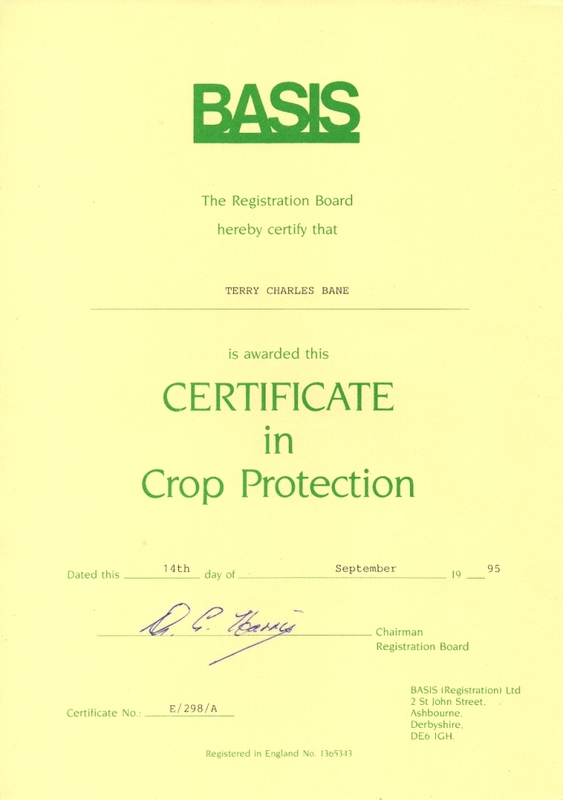 Professional Register to become "Practitioners Providing Professional Pesticide and Plant Nutritional Advice", my specialist areas were Amenity and Fertilisers. To keep on the B.A.S.I.S. 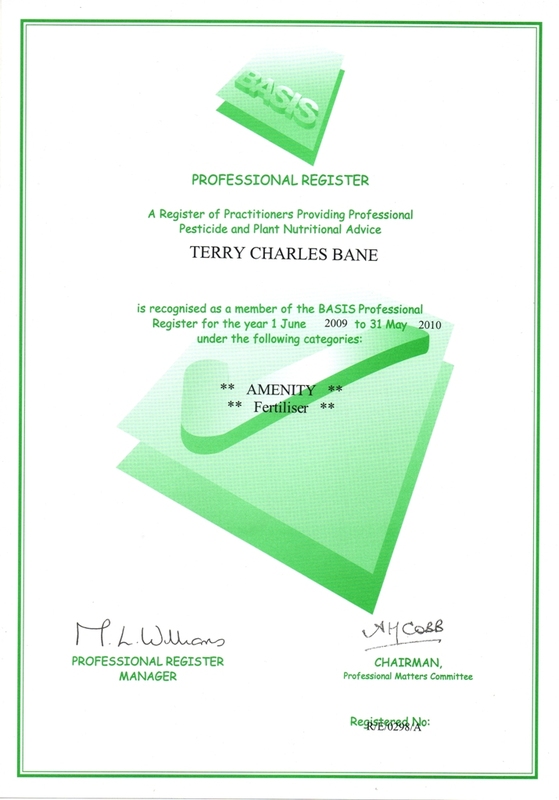 professional register advisors and practitioners had to annually keep their knowledge updated gaining CPD (Continuing Professional Development) points to log and submit, I was very lucky my employer supported and let me select appropriate conferences, seminars, trade exhibitions and attend specialist courses to keep me on the register, the events and courses took me across the country as well as local to keep my specialist knowledge up to date. From 1995 to 2010 I attended many courses my favourite place of learning was Harper Adams University College near Newport in Shropshire, I sat many B.A.S.I.S. 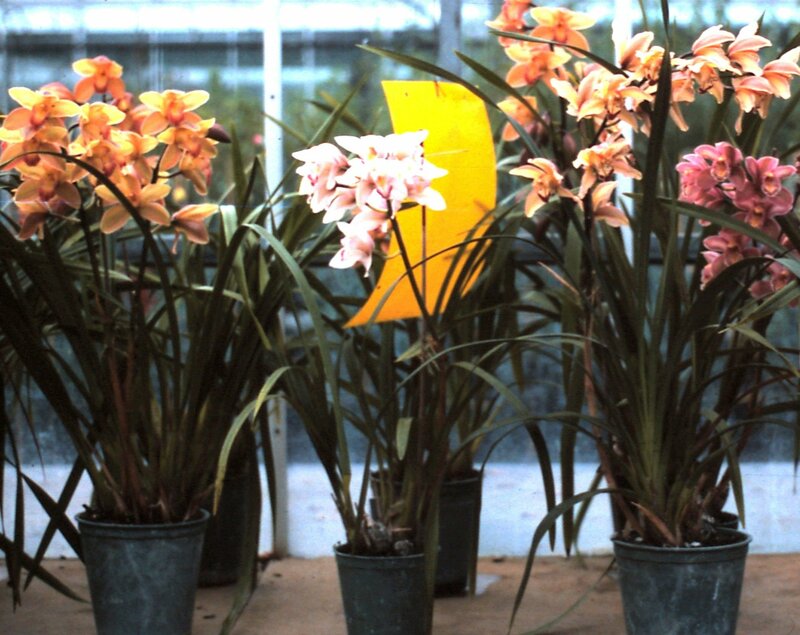 exams at the college including, Pesticide Technology and F.A.C.T.S. Locally I sat many B.A.S.I.S. exams with the Fakenham and Dereham Training Group which later became The Training Association at various locations and venues across Norfolk and Suffolk including Public Houses, I really enjoyed the Kings Head, Woodton, Norfolk close to my home where the tutor kept the log fire well stacked during tuition. Most of the college courses were during student holiday times, sometimes accommodation was available on campus, the food was usually exceptional, other times I had to find local hotels, The Lion Hotel in Shrewsbury was a favourite. When I began B.A.S.I.S. training I did not realise that by taking and passing various modules that they would add up and eventually lead to my B.A.S.I.S. 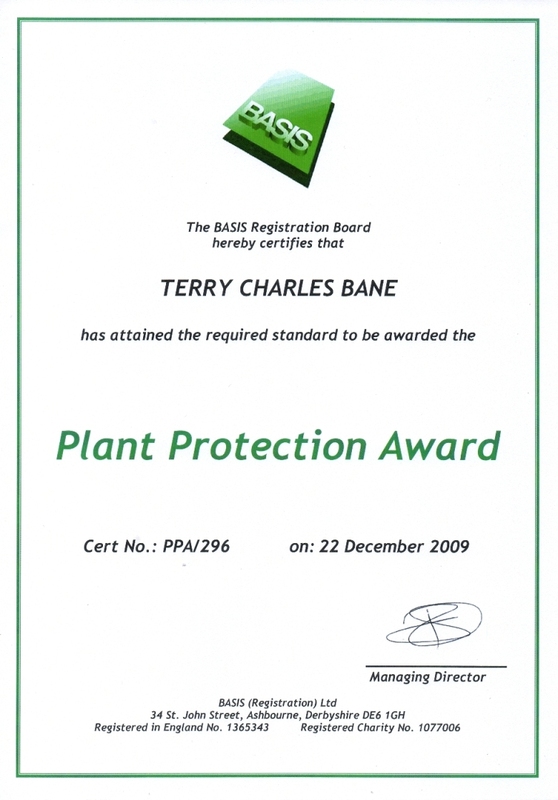 Diploma in Agronomy Award in 2009 something I am very proud to have achieved. The reason I was asked to attend B.A.S.I.S. 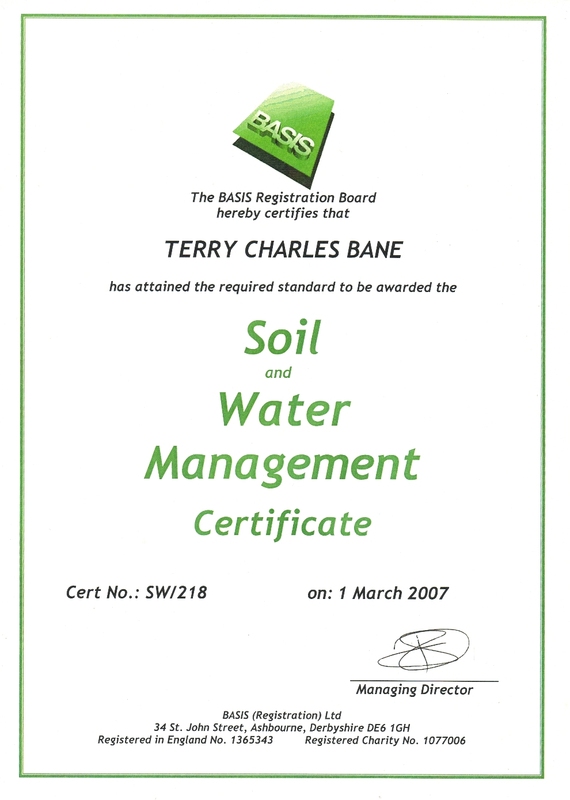 training and pass exams was for myself to be "Deemed Competent" to advise and monitor contractors management and practices with pesticides on behalf of my employer. For myself it was much more then this, I would ensure the most appropriate products were used and practices carried out in the most efficient and safe manner, I learned and perhaps had a better understanding of alternative practices and products, observation and different approaches to reduce and in some cases not use pesticides but use other practices and techniques that were better environmentally as well as economically and perhaps helped nature and keep balance, I always did and still do encourage "Good Cultural Practices and Alternatives"
I really enjoyed my time training and on the B.A.S.I.S. 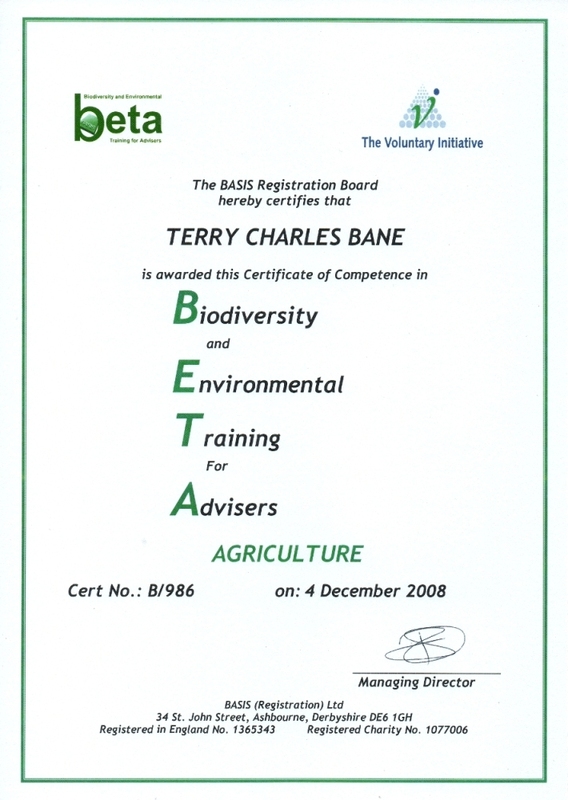 register over 15 years my biggest disappointment was that I was just unable to continue for one more year to achieve a second Graduate Diploma Agronomy with Environmental Management at Harper Adams University College through more nutritional training. I still read about current pest, disease, weed control and nutrient management and buy old pest and disease books to add to my library, some of the old reference books have great photos and diagrams of unseen pests. These days I use my knowledge of pests and diseases at The Dell, I see and photograph many Friends and Foes on the plants we grow in our 1 acre garden which can be seen here on our website.